The Garmin handheld GPS comparison chart below shows all current Garmin backcountry and marine handhelds (in alphabetical order) that include a high-sensitivity chipset. I do not recommend any units without such chipsets for backcountry use. Links go to my Garmin handheld GPS review/resource pages for each model except where I’ve yet to post those; in that case the links go to the Garmin product page. Features in the headers are explained below the chart, while recently discontinued models are shown on a separate page. You might also find my handheld GPS buyers guide and specialty GPS buyers guides helpful. NEW: Click on column headers to sort chart. Display type – Monochrome and older high resolution (hi-res) units tend to be more difficult to read in daylight conditions. Even so, the newer hi-res units are suitable for handheld use, where you will intuitively tilt the screen for the best view. They can also be customized to enhance viewing in bright conditions. The only “hi-res” units I recommend for fixed mount, non-external power use (e.g., bike handlebars) are the Dakota and Oregon 6xx series. Ability to add maps/storage – If a unit accepts maps, the storage medium or available internal memory is listed. Units with pre-loaded detailed maps also offer some internal storage, in addition to SD/microSD. Please note that there are lots of free maps available for these units. Electronic compass – These units also have a barometric altimeter. You can read more about electronic compasses here. A two-axis compass must be held level; a three-axis (AKA tri-axial) compass does not need to be held level, but is more of a pain to calibrate. Units listed as auto generally do not need calibration. Paperless geocaching – These units will display the full geocache description, cache size, difficulty and terrain ratings, and recent logs. 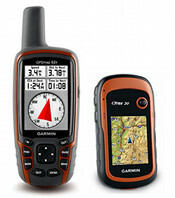 i don’t know anything about this device but i heard that garmin is the best company for gps system and surveying, ,the thing thing is that i want to buy a device which could help me in measuring accurate latitudes ang longitudes for my projects can you suggest me which model might be best for this.